Can I just start by saying how blessed I am to have such an amazing husband? I know, some of you are probably sick of hearing about him, but yesterday, when I came up to him while he was in the middle of one of his projects to tell him that a few of my llamas were acting like they were getting pretty hot, he dropped everything he was doing and came with me to the barn immediately to shear a few more. No complaints. No questions asked. Joker being shorn. That boy stands like a champ every time. So, why do you shear? You might not know that llamas and alpacas are wool bearing animals. Though not as famous for that job as sheep, they have a high quality, hypoallergenic wool. Unlike sheep wool, there is no lanolin to complicate the whole wool-to-product process. It’s lovely stuff. However, in my area of the world, it isn’t just about harvesting a useful animal product, it’s about keeping my llamas safe and happy. Lamas and alpacas are Andean animals from Chile, Bolivia, Argentina, and Peru. While we would probably think of those places as hot, the truth is that, in the mountain ranges, it’s pretty temperate to chilly. Their wool protects them from the chill in those regions. It does a pretty good job of protecting against our winters. It can be a death sentence throughout our summers. 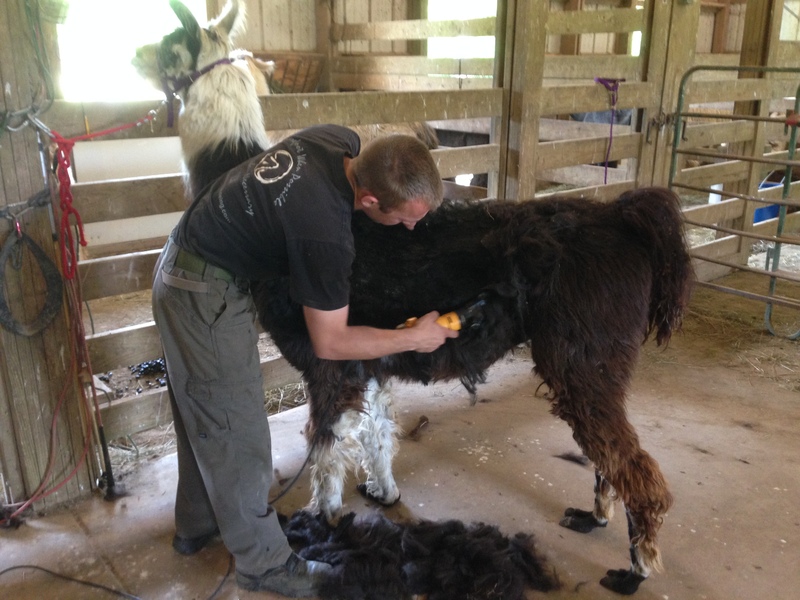 We shear our llamas so they don’t overheat AND to harvest their lovely wool. It’s a very symbiotic relationship. Merida is a rescue with less than stellar behavior, but she does stand fairly well for shearing. I’m not sure why, but most people seem to be under the impression that shearing is a knock down, drag out between us and the llamas. It’s really not. While some animals are more difficult than other–one particularly petulant little monster did manage to kick Jeremiah pretty good this year–most realize that having no wool feels far better than having gobs of it, and they will stand accordingly. 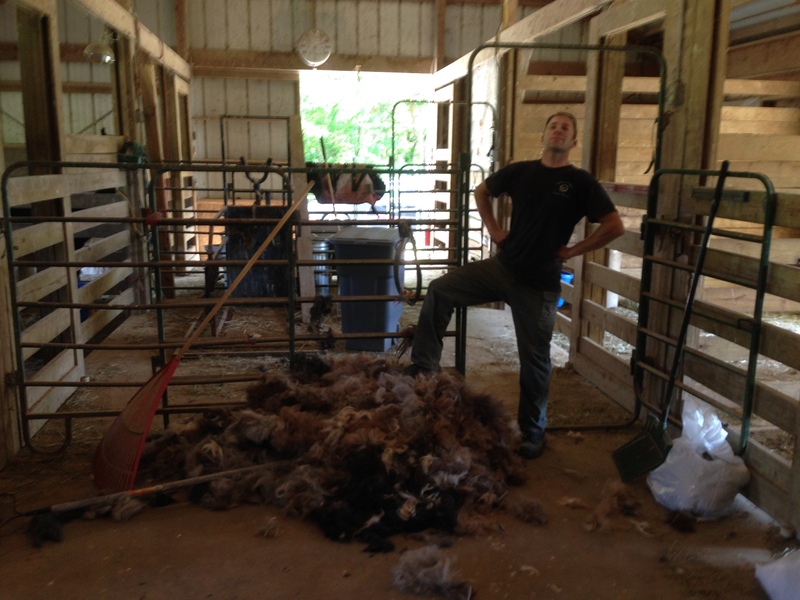 (I’ve noticed their behavior for shearing is even better when it’s hot on shearing day.) Even our alpacas, who some people in the industry insist on laying out like sheep, stand very well to be shorn. I’ve heard horror stories of shearers who, for example, tie the animals’ feet and drop them to the ground. In my experience, that sort of procedure is traumatizing and unnecessary. Also, those shearers are the ones most likely to kill an animal by accidentally breaking it’s neck. How do you decide who to shear first? I have had several people ask me this year how I decide who to shear first and how I pick their haircuts. (We stretch shearing out over a week or so. Not everyone is shorn on the same day.) It’s fairly commonsense. If an animal looks hot, or has a risk factor (age, especially heavy wool, etc), he or she is shorn early. Older animals, however, end up keeping more of their wool (especially on the neck) because wool growth slows down as they age. I want to make sure they will be able to keep warm over the winter. What do you do with all of that wool? Junk wool has been conquered. Some, we use to take funny pictures. 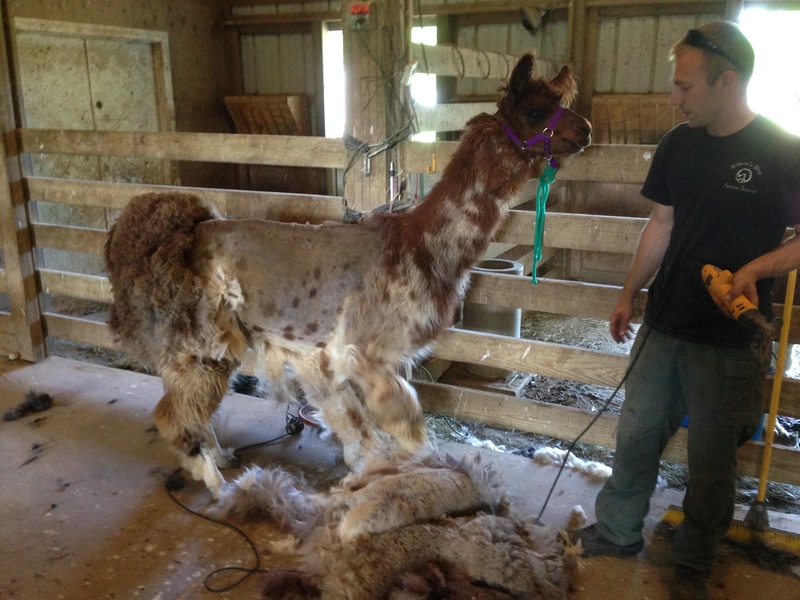 Are any of you wondering about llama wool or shearing? (Or llamas in general?) I would love to field questions! Shoot! I fell in love with a young one, simply because it kissed me. I don’t plan on helping again, but at least, if I pick up spinning again, I know where to buy that wonderful fiber.